We’d love your help. 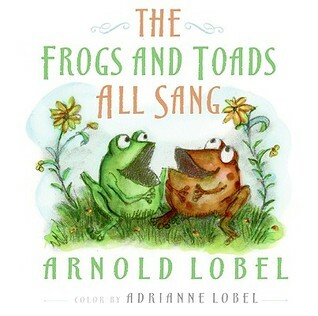 Let us know what’s wrong with this preview of The Frogs and Toads All Sang by Arnold Lobel. To ask other readers questions about The Frogs and Toads All Sang, please sign up. Normally I'm not a fan of works published posthumously. It seems to me that if the author wanted it published, he would have done so... otherwise it can assumed that it just wasn't 'ready' or 'fit' for publication. However, this is a discovery by a daughter, and the verses are successful (charming, silly, etc. as others say), and I'm accepting it. The only thing you need to know, besides the fact that I recommend it, is that has not as tight a controlled vocabulary as a Leveled Reader, and is the Normally I'm not a fan of works published posthumously. It seems to me that if the author wanted it published, he would have done so... otherwise it can assumed that it just wasn't 'ready' or 'fit' for publication. However, this is a discovery by a daughter, and the verses are successful (charming, silly, etc. as others say), and I'm accepting it. This is the sweetest most darling and endearing collection Arnold Lobel has to offer. You read each little poem-story, gaze at the accompanying illustration, and immediately want to hug the frogs and toads to pieces. Illustrated in a different, more "honest" style than his classic Frog and Toad series, this book is a must-own. This is a sweet collection of poems by Arnold Lobel, and the fact that Adrianne Lobel put it together as a loving tribute to honor her father made it even more special. The illustrations are cute and the poems are fun. The Frogs and Toads All Sang is a sweet, funny posthumous publication. The ten poems included were discovered in the papers of Arnold Lobel, best known for his award-winning Frog and Toad series, by his daughter, who illustrated the collection with easy watercolor I'm always on the lookout for standout illustrated poetry collections. Short poems are great for autistic kids. It's okay to have a short attention span when you read them, and there is usually some underlying structure or rhyme scheme. Read aloud for homeschool! Adorable children's poetry that my boys loved, my oldest even turned a few into a rap- ha ha! Very cute little rhymes that gave Nicholas and I a giggle. Not bad. The poems are enjoyable enough as well as the illustrations but I’m glad there are more Lobel classics to enjoy other than this newly found collection. 3.5 stars. Our family is familiar with the early-reader format of Arnold Lobel's Frog and Toad stories, which we love. So this collection of rhymes caught my eye during our most recent library visit. The little poems contained in this book are simply charming. They're clever. Funny. Sweet. They are everything you'd expect from Arnold Lobel. C would pause to think after each one, then laugh and laugh once she "got" the humor. 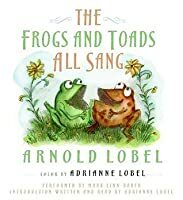 In the book's introduction, Adrianne Lobel says these poems are the "first time [Arn Our family is familiar with the early-reader format of Arnold Lobel's Frog and Toad stories, which we love. So this collection of rhymes caught my eye during our most recent library visit. In the book's introduction, Adrianne Lobel says these poems are the "first time [Arnold Lobel] wrote about frogs and toads." They are a foretaste of the stories to come; you can feel the same light, friendly spirit found in the beginning readers. Adrianne added her own talents in watercolor to her father's line illustrations, resulting in a beautiful "new" Arnold Lobel book for little ones (and parents!) to enjoy. Before he became famous for his Frog & Toad books, Arnold Lobel wrote and illustrated this collection as a gift for friends. Discovered in late 2008, Lobel's daughter Adrianne knew it needed to be published. She added the color to the illustrations herself. In ten poems, we get a glimpse of the young Arnold Lobel. What I thought: I loved it! I enjoyed The Frogs and Toads All Sang as much as Odd Owls and Stout Pigs. In fact, I'd like to read all of Lobel's work. 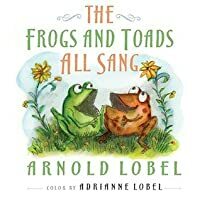 The poems are fun and the illus Before he became famous for his Frog & Toad books, Arnold Lobel wrote and illustrated this collection as a gift for friends. Discovered in late 2008, Lobel's daughter Adrianne knew it needed to be published. She added the color to the illustrations herself. In ten poems, we get a glimpse of the young Arnold Lobel. What I thought: I loved it! I enjoyed The Frogs and Toads All Sang as much as Odd Owls and Stout Pigs. In fact, I'd like to read all of Lobel's work. The poems are fun and the illustrations are just right. Adrianne did a great job on the color. My favorite poems are "The Frogs and Toads All Sang," "Polliwog School," "Made for Toads," "There Was a Frog," and "One Summer Night." My favorite illustrations are dancing and driving. This group of poems written by Arnold Lobel and illustrated (partially) by his daughter Adrienne is absolutely delightful. Frankly, I have never been a huge fan of Lobel's Frog and Toad series (I acknowledge its importance to children's literature, but never really enjoyed the books), but these frogs and toads are just wonderful. Each poem is funny and clever, and the rhymes don't feel forced at all. The accompanying illustrations echo the fun of the poems. The illustrations are sketches by Lobe This group of poems written by Arnold Lobel and illustrated (partially) by his daughter Adrienne is absolutely delightful. Frankly, I have never been a huge fan of Lobel's Frog and Toad series (I acknowledge its importance to children's literature, but never really enjoyed the books), but these frogs and toads are just wonderful. Each poem is funny and clever, and the rhymes don't feel forced at all. The accompanying illustrations echo the fun of the poems. The illustrations are sketches by Lobel himself that his daughter has carefully and beautifully colored. This is a short collection of poems about frogs and toads written by the late Arnold Lobel, the author of the beloved Frog and Toad stories. The poems were discovered by his daughter, who is the illustrator of this collection. I read three of the poems--"The Frogs and Toads All Sang," "Made for Toads," and "A Toad Was Feeling..."--for a toad- and frog-themed story time program at the Great Valley Museum of Natural History at Modesto Junior College. The poems are short, sweet, and silly. I also r This is a short collection of poems about frogs and toads written by the late Arnold Lobel, the author of the beloved Frog and Toad stories. The poems were discovered by his daughter, who is the illustrator of this collection. I read three of the poems--"The Frogs and Toads All Sang," "Made for Toads," and "A Toad Was Feeling..."--for a toad- and frog-themed story time program at the Great Valley Museum of Natural History at Modesto Junior College. The poems are short, sweet, and silly. I also really liked the pictures. Having both frogs and toads featured also helped me to reinforce the differences between frogs and toads that they had learned from my reading of Tale of a Tadpole by Barbara Ann Porte. This is a collection of rhyming stories about frogs and toads written by Arnold Lobel, author of the famous Frog and Toad books. They were discovered by his daughter Adrianne Lobel after his death. While not an official part of the series, they serve as a nice companion. I found the poems delightful. It was a very pleasant discovery as I love the Frog and Toad books. This is a song/poetry book about the different activities that frog and toads do. I chose it for it's song and poetry value which is what I would use it in class for. This book could be used all the way up to 3rd graders. I would do some music and movement activities with my classroom. for instance, as each song has a theme I could create a corresponding movement or dance to go with the song. I loved the Frog and Toad books when I was little. My mom bought this previously-unpublished collection for me a couple of years ago. It's not really an official Frog and Toad book, but you can see how those developed from this earlier, private work. The poetry is cute and fun, as are the drawings. Families should enjoy reading this together. My five-year-old son picked this book out of the library this week. And I am so glad that he did. These poems have all the wit and humor of the Frog and Toad stories, but with a heaping dose of charm. The illustrations, which are softer (and less 1970s) that those of the Frog and Toad, should prove to be timeless. Adding this book to my list of books that I need to buy. This is a poem book. I usually do not read poetry to the kids because they get bored quickly, but this book the poems are all really good and fun to read. The illustrations are great to look at too...so my almost 3 year old granddaughter and I shared reading time, learning time and giggles last night as we read this book. The Frogs and Toads All Sang is a collection of short, humorous frog and toad tales. The colorful, imaginative illustrations and quick verses will be a welcome addition to the storytime theme. Used for "Frog Fever" Family Storytime-May, 2010. Full of colorful pictures and funny poems (not songs), this book would be a great introduction to poetry for students K-2. I enjoyed reading a rhyme or 2 everyday as the students quietly lined up for lunch. They kept asking for more! Love this! Whimsical rhymes about silly frogs and toads...they drive fast, dance in lemonade and eat too much! Delightful watercolors by Arnold's daughter, Adrianne, who tells us in the introduction more about the unearthing of this book. Sweet; really really sweet - Arnold Lobel's Frog and Toad books have always been my favorites and what a wonderful tribute by his daughter, Adrianne Lobel to enhance his drawings and poetry with her artistic talent for watercolors. It was a cumulation of poems about frogs and toads, the pictures were nice and a few of the poems would be humorous to a child. Even though most didn't make sense the rhyming was excellent and easy to read. Cute illustrations. Fun rimes. Nothing fabulous though. Great introduction to poetry for young kids.